Ho, Ho, Ho! 3 Redneck Tenors Christmas SPEC-TAC-YULE-AR is a can't miss for the holiday season. Yes, those singing angels in the trailer park are packing their festive mullets and will be dashing through the snow just in time for some down home Christmas cheer! Grab the family and saddle up the ol’ sleigh and come on down for an unforgettable night of music and laughs. What better way to bring families together than to enjoy a special Christmas with the boys? 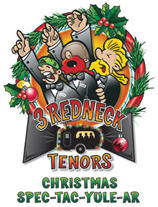 Come and take a magical, musical Christmas journey with the 3 Redneck Tenors to liven up your holidays this year. We’re recommending a healthy dose of 3 Redneck Tenors Christmas SPEC-TAC-YULE-AR. It’s Christmas music like you’ve never heard and won’t easily forget. I guarantee ya! These real life Broadway and Opera stars are ready to rock your holidays with classic, pop and deep-fried fest of musical delights. There’s nothing old-fashioned about this music arranged by award-winning composer Craig Bohmler – it’s infused with vitality, energy and passion. Sleigh Ride, White Christmas, I’ll Be Home for Christmas, Santa Baby, Santa Claus is Coming to Town, Blue Christmas, O Holy Night, Winter Wonderland, Jingle Bells,and Silent Night. You’ll also enjoy Christmas spoofs likeGrandma Got Run Over by a Reindeer and I Saw Mommy Kissing Santa Claus and a few other great surprises! It’s foot-stomp’n, toe-tapp’n, bell ringing fun for the whole family. So don your Christmas mullet and come join us for 3 Redneck Tenors Christmas SPEC-TAC-YULE-AR. 3 Redneck Tenors Christmas SPEC TAC YULE AR!